Born in Newport, Rhode Island on 22 December 1727, young William was the second son of William Ellery and Elizabeth Almy. Elizabeth Almy, William’s mother, was the granddaughter of Christopher Almy. Christopher was born in England, and at the age of three, sailed in the Abigail with his mother, father and siblings and settled in Portsmouth. William Ellery’s father graduated from Harvard in 1722, was a well-to-do merchant, and as the eldest son inherited a major part of his father’s estate. He was a deputy and assistant in the Colonial Assembly, judge of the county court, and deputy governor of Rhode Isalnd. .
Ellery’s father tutored his namesake son who was able to enter Harvard at age sixteen, from which he graduated in 1747. Upon returning to his home in Newport, young William Ellery entered into his father’s mercantile business, learning the details of shipping and trade. About this time he also became a Naval Officer of the Colony of Rhode Island, learning about naval affairs that would stand him in good stead somewhat later in his life. In 1748 he became a Master Mason in the First Lodge in Boston. William Ellery married Ann Remington, the daughter of Jonathan Remington and Lucy Bradstreet in Newport, RI on 11 October 1750. By her he had seven children, five of whom survived to adulthood and had issue, but she died in Newport, RI on 7 September 1764, after fourteen years of marriage. William Ellery then married (2nd) Abigail Cary, the daughter of Nathaniel Cary and Elizabeth Wanton in Newport on 28 June 1767. By her he had ten more children, only two of whom survived to adulthood and had issue. The other eight children either died young or unmarried. Abigail died in Newport, RI on 27 July 1793. In 1764 Ellery was one of the founders of Rhode Island College and one of its incorporators. During the period of his first marriage to the end of the French and Indian War in 1763, Ellery became a Clerk of the Court. Not only was his handwriting quite excellent, he gained some knowledge of the practice of law, of writs, and deeds, and procedure. He expanded upon this opportunity and the raw work of clerking, by also studying the law, passing the Bar and entering into practice in 1770. As the colonial disputes with England became more and more intense, Ellery helped lead a riotous march of Rhode Islanders though Providence in resistance to the Stamp Act in 1765, and again helped support efforts against the Intolerable Acts of 1767. The First Continental Congress, meeting in Philadelphia in the Fall of 1774, aroused admiration in Ellery for the stand they made in resisting British authority on matters internal to the Colonies. He felt strongly that the local bodies in each colony were quite capable of managing their own internal affairs without the intrusions of Royal interference from more than 3,000 miles away. 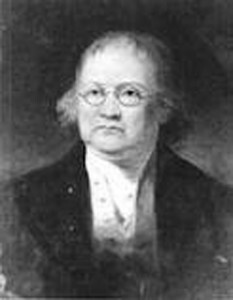 While Ellery was not a member of the First Continental Congress, he knew law and had connections and correspondence with many important people both in Rhode Island and the other New England Colonies. He was able to gather information, informing him to abhor what the British Parliament was doing. The idea of “outsiders” dictating to people about whom they had little or no information, and about whom they had no care or concern, bothered Ellery a very great deal. He saw this attitude as unjust and irresponsible. Leaders should be aware of the problems of the people they were leading. After the actual fighting at Lexington/Concord on 19 April 1775, and the assembly of the Second Continental Congress on 10 May, Ellery became extremely concerned that no pusillanimous approach to the British acts of violence, such as “accommodation” that a few delegates were espousing, would gain approval. Ellery announced, “You must exert yourself. To be ruled by Tories, when we may be ruled by Sons of Liberty â€” how debasing. There is liberty and fire enough, it only requires the application of the bellows. Blow, then, a blast that will shake this country.” He let it be known that he would stand for office as a delegate, should a vacancy occur. Samuel Ward, one of the Rhode Island Delegates, was, by early in the year 1776, too ill to continue in office, dying of smallpox in March. Therefore another election was held by the Rhode Island Legislature on 4 May and William Ellery was chosen to replace Mr. Ward. Ellery attended the Second Continental Congress in Philadelphia and presented his credentials on 16 May, 1776, and took his seat. During his first months in the Congress, Ellery served on a Committee to procure clothing for the American Army, but, it was soon discovered that he had many connections with shipping magnets and naval matters, and thus was soon placed on the Marine Committee. He was a faithful member of the Congress, serving on several committees, besides his principal duties on the Marine Committee and the Admiralty Court. In 1778 he signed the Articles of Confederation, the first constitution of the United States. At the time of the British invasion and occupation of Newport, Rhode Island in the Summer of 1778. They fortified themselves and continued a headquarters there for some time. In the course of this occupation, the British burned Ellery’s dwelling house and did much damage to other property of his in and near the city. In 1779, William Ellery was a member of the Committee to settle some diplomatic problems among the American Commissioners in Europe. Ellery continued in service with the Congress until 1786, with only a few brief absences. In 1785, Ellery supported Rufus King in efforts to abolish slavery throughout the country. He was appointed Commissioner for the Continental Loan Office of Rhode Island in early 1786, and for a time was Chief Justice of Rhode Island, holding that office for a short time only. In 1790, with the organization of the country under the new Constitution, President Washington appointed William Ellery as Collector of Customs for the Newport District, a post he retained through all the changes of national administrations until his death thirty years later. Ellery was always an interesting and well-informed speaker. 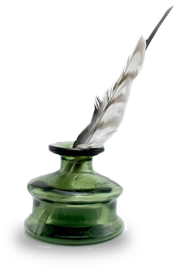 His written hand was in an elegant, secretarial form, as attested to by his signature on the Declaration of Independence. He was widely read, not only in English, but in Greek and Latin, and a marvelous correspondent and conversationalist. Well thought of by many of his colleagues, his advice was sought upon many matters, and his influence, both in and out of the Congress, was considerable. William Ellery, having sired seventeen children, outlived two wives, and served the Federal Government under eight administrations and five Presidents, died at his home in Newport, Rhode Island on 15 February 1820. He was 92 years old, a venerable, honorable servant to his country and the people he represented. At the time of his death he was sitting in his chair reading De Officiis. William Ellery is one of only three signers who lived into his 90s, the others being John Adams and Charles Carroll of Carrollton. Ellery was buried in the Common Ground Cemetery at Newport, and a memorial ledger marks his grave. 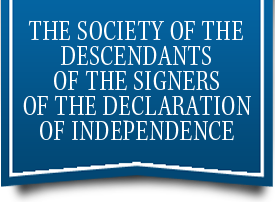 It was restored in 1965 by the Rhode Island :State Society of the Daughters of the American Revolution.